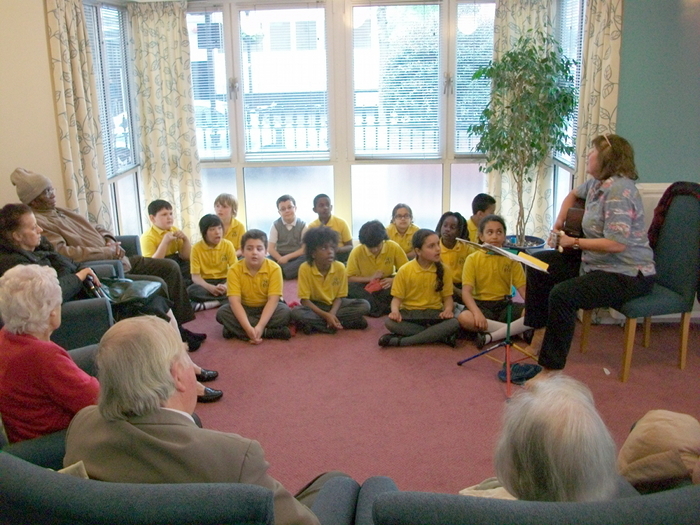 Children from All Souls Church of England Primary School came to Fitzrovia Court this week to put on a singing performance to entertain older people living in Fitzrovia. Children have been performing a regularly sing-song, organised by Fitzrovia Neighbourhood Association’s Older Fitzrovia project at Westminster Council’s sheltered housing site in Carburton Street for the past four years. This entry was posted in Older Fitzrovia and tagged All Souls Church of England Primary School, Charity, Fitzrovia, Fitzrovia Court, London. Bookmark the permalink.